Adenoviruses are relatively simple, double-stranded DNA viruses that infect humans and other vertebrates. The virus particle consists of a simple icosahedral shell, or capsid, containing a single linear dsDNA molecule of approximately 36,000 base pairs. A terminal protein protects each end of the DNA. The capsid is made of 240 hexons , each of which is a trimer of the hexon protein. Hexons are named for their sixfold symmetry and are each surrounded by six neighboring hexons. The hexon protein has loops that project outward from the virus surface. Adenoviruses are subdivided into about 50 serotypes by their response to antibody binding. This variation is largely due to variation in the loops of the hexon protein. Five faces of the virus particle converge at each vertex. Here is found a penton , which consists of a base (a pentamer) plus a fiber (a trimer). The fiber varies greatly in length in different subgroups of adenovirus and its tip binds to the receptor on the host cell surface. and a fiber (black strand). Proteins IIIa, VI, VIII, and IX stabilize the capsid. A strand of double stranded DNA is packaged inside the capsid, with two terminal proteins toprotect the ends. The adenoviruses share the same receptor as B-groupcoxsackie viruses. This protein is therefore known as CAR (or coxsackievirus adenovirus receptor ), but its normal physiological role is unknown. Adenoviruses enter human cells by recognizing two receptors, CAR and integrin. The virus is taken into the cell attached to the receptors and surrounded by a membrane vesicle that dissociates in the cytoplasm. 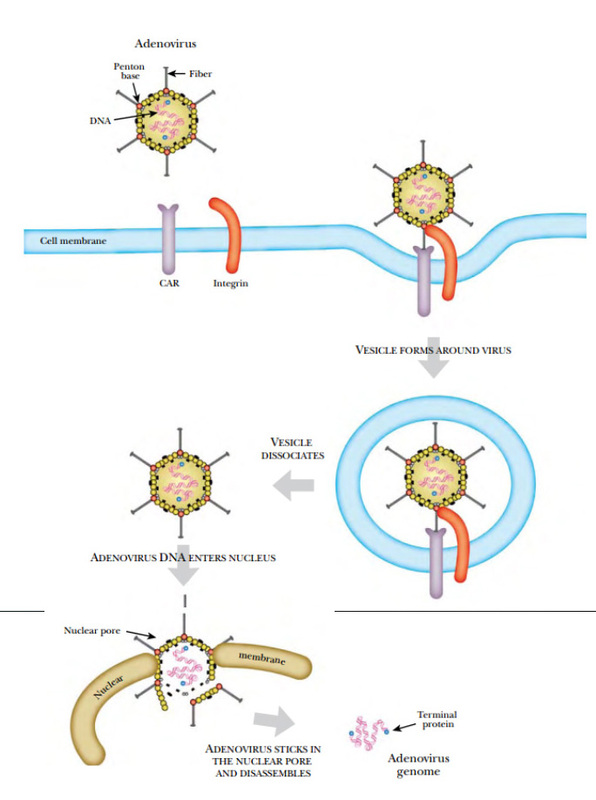 The adenovirus injects its DNA into the nucleus through a nuclear pore. After the fiber tip binds to CAR, the penton base binds to integrins on the host cell surface. (Integrins are transmembrane proteins involved in adhesion.) Next the membrane puckers inward and forms a vesicle that takes the adenovirus inside the cell. The virus is then released into the cytoplasm and travels toward the nucleus. The virion is disassembled outside the nucleus, and only the DNA (with its terminal proteins) enters the nucleus. (a) Adenoviruses are relatively harmless. They cause mild infections of epithelial cells, especially those lining the respiratory or gastrointestinal tracts. (b) Adenoviruses are nononcogenic (i.e., they do not cause tumors). (c) Adenoviruses are relatively easy to culture and can be produced in large quantities. (d) The life cycle and biology of adenovirus are well understood. (e) The function of most adenovirus genes is known. (f) The complete DNA sequence is available, in particular for adenovirus serotype 5 of subgroup C.
First, it promotes transcription of other early virus genes. Second, it binds to host cell Rb protein, which normally prevents the cell from entering S-phase. This prompts the host cell to express genes for DNA synthesis, which the virus utilizes for its own replication. In the lab, crippled adenovirus is grown in genetically modified host cells that have the viral E1A gene integrated into host cell DNA. The virus particles generated by this approach cannot replicate in normal animal cells. protein so releasing host E2F protein to activate DNA synthesis. The DNA of adenovirus is packaged by a headful mechanism. If the DNA is more than 5% shorter or longer than wild type, packaging fails Insertion of a therapeutic gene into an adenovirus will make the DNA longer. If the inserted gene is much longer than the deletion used to cripple virus replication, the virus will fail to assemble correctly. Deleting other nonessential virus DNA solves this problem. Although genes carried on engineered adenovirus have been expressed successfully in both animal and human tissues, there are problems. The major difficulty is that adenovirus infections are short-lived. Thus the therapeutic gene is expressed for only a few weeks before the immune system eliminates the virus. Furthermore, the patient develops immunity to the virus so that a second treatment with the same engineered virus will fail. Thus adenovirus vectors cannot be used for long-term gene therapy for hereditary diseases. is much longer than E1A, then a region containing gene E3 is deleted to keep the overall length of the DNA constant. Even with the limitations just described, adenovirus vectors may help deliver a deadly gene to cancer cells. Here only a short period of expression should be needed. The CAR receptor is normally only expressed highly by epithelial cells, which limits adenovirus entry to these cell types. However, many cancers also express the CAR receptor at high levels. Consequently, the majority of gene therapy trials using adenovirus are now aimed at cancer cells.